As the United States goes more and more high-tech, technology – including the cable industry – is growing more and more “green.” This year marks the 47 th celebration of Earth Day , a day started in 1970 when the cable industry was in its infancy . Today, cable is proud of its commitment to energy savings and other environmental protections. Comcast and Texas Southern University (TSU) recently announced plans to offer Xfinity On Campus to students. With this new service, students can now watch live TV, On Demand and recorded content on their IP-enabled devices, including laptops, tablets, smartphones and Roku players. The service is included with room and board and available to students living in on-campus housing. Comcast announced in March that it is launching a new internet service that will deliver speeds up to 1 Gigabit-per-second (Gbps) to residential and business customers throughout the Greater Houston area. These speeds will be among the fastest and most widely available in the region and include access to the nation’s largest Wi-Fi network of more than 18 million hotspots. Spectrum TV™ customers in the Rio Grande Valley will soon enjoy access to even better picture quality and more than 65 additional HD channels as the company moves toward a 100-percent all-digital network, creating a platform for faster speeds, more content and new features. The all-digital upgrade for customers in the Rio Grande Valley is scheduled to begin on April 3 in Rio Grande City, and will continue for several weeks, with different communities upgrading each week through early May. Spectrum is notifying customers in Rio Grande City, Pharr, Weslaco, Mission, Edinburg, Harlingen, Laguna Vista, Los Fresnos and Brownsville of their specific upgrade date and the need to acquire a Spectrum digital receiver for each of their televisions. A Spectrum employee volunteer team of 20 people spent a Saturday in March repairing a home in Rockport. Rockport Mayor Charles, “C.J.” Wax attended and thanked Charter Spectrum for its commitment to Hurricane Harvey recovery. The effort was part of Charter Spectrum’s $1.35 million storm-related recovery pledge to the Texas Gulf Coast area. The March event in Rockport was done the same day as rebuilds in Melbourne and Tampa, Fla., following Hurricane Irma there. 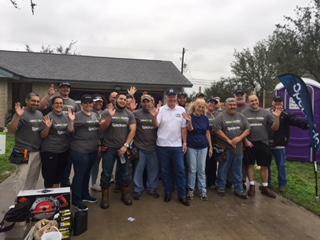 The events combined Spectrum folks with staff from Rebuilding Together, Charter Spectrum’s national construction partner in the non-profit world. These and other outreach events are part of the Spectrum Housing Assist program, whereby the company is aiming to make 50,000 homes nationwide safer by 2020. Check out great programming by TCA Associate members Hallmark, INSP, Reelz and Turner.